The 2005 sailing days are numbered, so when I have a free afternoon and favorable conditions, I am on the water. 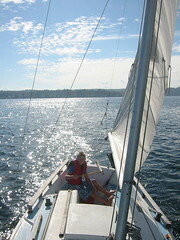 This afternoon, Josh DeKorte joined me for a relaxing sail to the central sound and back. Josh is always eager to join me and he is a great deckhand. Conversation is never lacking as his inquisitive mind keeps the dialogue active. Did you build your boat yourself? I can tell from the photo that she sails quite close to the wind, who is the designer? I built a 26-ft Wharram catamaran and sail it on the sea here, there are some photos on my blog back in Jan or Feb I think.